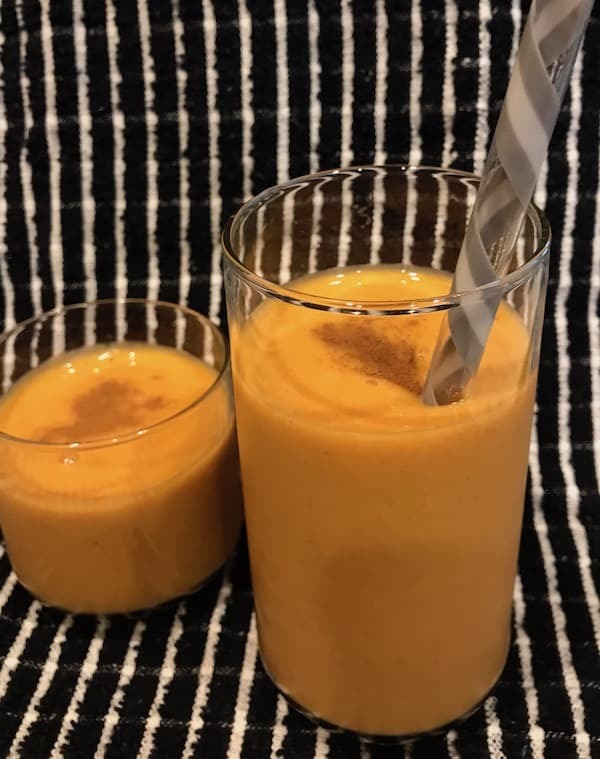 Pumpkin pie smoothies are delicious and nutritious. Additionally, they are super easy to make, so you can have them anytime. You don’t have to wait until pumpkins are in season, since this recipe uses canned pumpkin. You also don’t need to wait for your favorite coffee shop announces that the pumpkin flavor is now available. The pumpkin pie spice enhances the flavor of this delicious drink. It’s perfect for those times when you don’t want to heat up your whole house with a pie in the oven. Of course, it can’t take the place of a slice of pumpkin pie after your holiday meal. However, if you want a quick afternoon pick-me-up, it’s the quickest and easiest way to get your pumpkin fix. 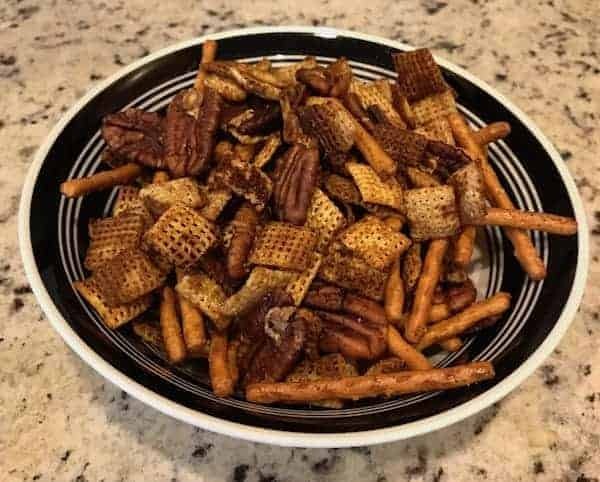 It’s a delicious treat to enjoy with your favorite party mix. Also offer it at your next party or special event. The recipe I’m showing here can be switched up by using a different type of milk. You can also use heavy cream if you’re not concerned about fat content or calories. Another thing you can do is use sugar instead of syrup or honey. I almost always have bananas. However, when I don’t, I might use an avocado to provide the smooth texture. 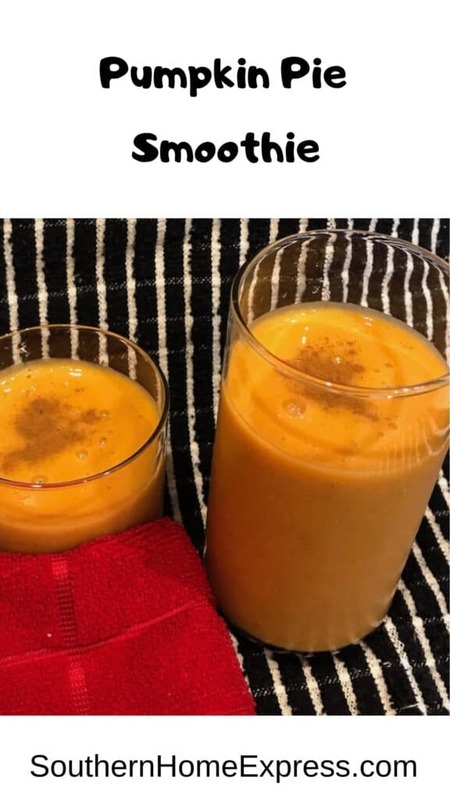 This pumpkin pie smoothie recipe is extremely versatile, consequently allowing you to make it how you like it. Don’t be afraid to experiment. After you blend it, take a taste, and adjust if needed. They can be served hot or cold, depending on the weather and your preference. If you need a little pick-me-up, add a splash of coffee. Always have a can of pumpkin on hand. After you open it, the pumpkin can be refrigerated and used for several days. You can also add some protein powder and have this nutritious smoothie for breakfast. During the spring and fall, I prefer pumpkin pie smoothie drink cold but not frozen. In contrast, during the summertime when it’s blazing hot out, I like it frozen. If you want a warm drink, you can forgo freezing the banana and stick the drink in the microwave to heat it up. That would be good with some whipped cream on top. 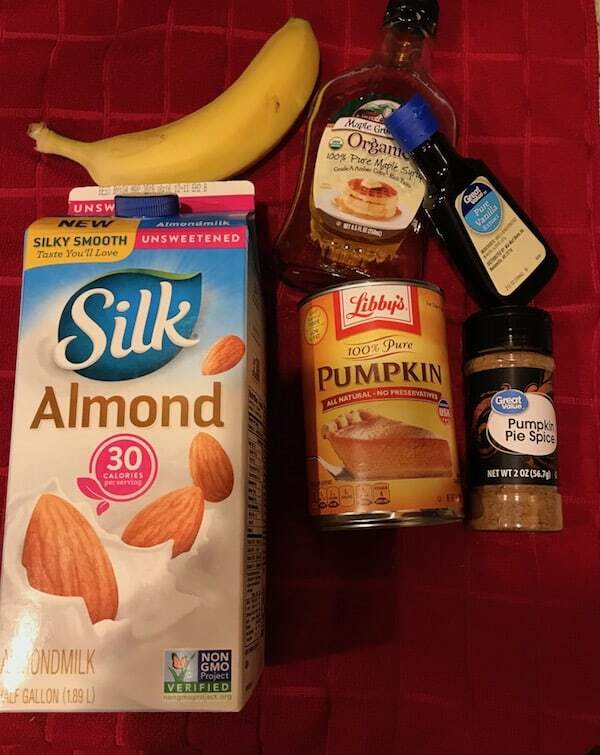 You only need 6 ingredients to make a pumpkin pie flavored smoothie the way I like it. However, you can change things up to make them the way you like them. Measure all of the ingredients, put them in the blender, and turn it on. Run it until it is creamy and super smooth. This can make one humongous drink, or you can have a couple of pumpkin pie smoothies. After all, it’s even better when you can share the deliciousness with someone you like. 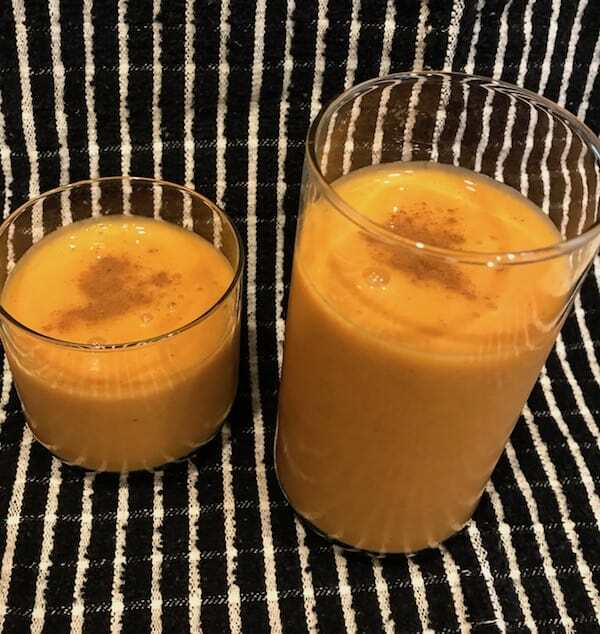 You can top your smoothie with whatever you want, such as my favorite—a dash or two of cinnamon. Another favorite topping is whipped cream. Did you enjoy this recipe? If so, please sign up for my newsletter. 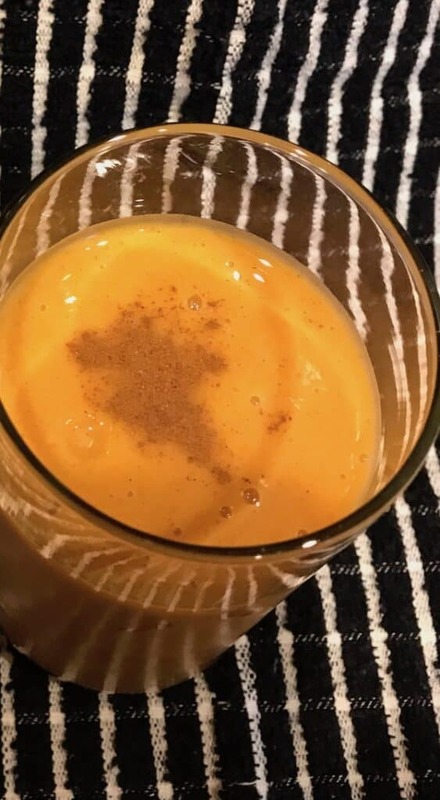 This delicious pumpkin pie smoothie can be enjoyed any time of year. You'll love the fact that you can make this to your personal taste. Put everything in the blender and blend until the smoothie is … well, smooth. If you like a little extra fall flavor, sprinkle some ground cinnamon on top. If you want it extra fancy and festive, add your favorite whipped topping, and then sprinkle on the cinnamon. 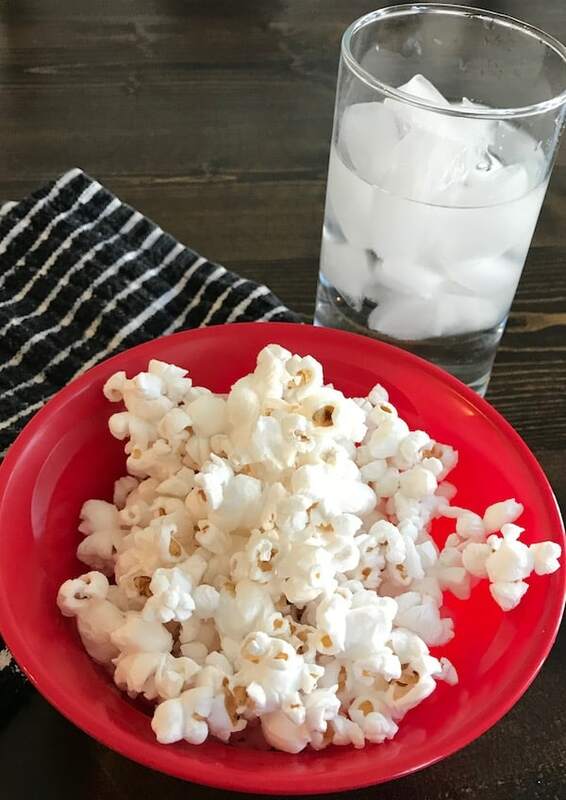 If you want something yummy to eat while sipping your smoothie, try either some buttery popcorn (without the butter) or Chex party mix.